Triad is not a framework, but a tool that can help structure your ui logic in a clean and concise way. Please note that Triad is still under development, and API's may will change. Although pretty stable, the need for simpler solutions and better API's may require changes in your code. Feel free to try it out and leave your feedback! Every screen in an application that uses Triad is represented by a Screen. A screen can consist of multiple components, each backed by a Presenter. In this case, we only have one presenter. The presenter communicates with a custom view (CounterView) through an interface (CounterContainer). The CounterScreen class defines which layout to use, and instantiates the CounterPresenter class. The CounterView is automatically inflated and bound to the presenter. The CounterView extends a ViewGroup, and reacts on user input of its children. The view notifies the presenter that something happened. The xml layout of the view is defined below. The root of the layout is a CounterView, and the TextView and Button are nested inside the CounterView. The CounterContainer acts as a separating layer between the presenter and view. 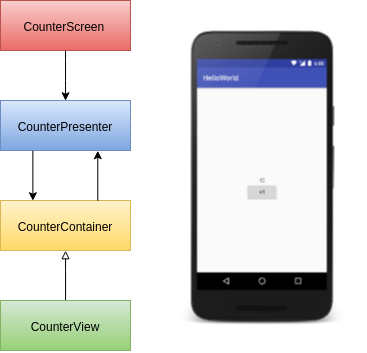 This makes it possible to create different implementations of CounterView for different devices, such as phones or tablets. Finally, the CounterPresenter handles any logic, and formats the data to display in the view. Presenters survive orientation changes, so our counter variable will not get lost on a configuration change. Navigating through screens is based on earlier versions of Square's Flow.